Whether you love wintry weather or you have never seen a snowflake, one of the factors in your college search may include the climate. That’s why Go See Campus is taking a look at campus life at cold weather colleges. While there is no one definition, let’s just agree that a “cold weather college” is one where winter weather is the norm. In other words, it’s a college that offers heavy snowfall or low temperatures for a major part of the school year. During Go See Campus’ interviews with alumni, there were some common themes to the responses. One of them: campus life at cold weather colleges offers a lot of great opportunities… if you take advantage of them. 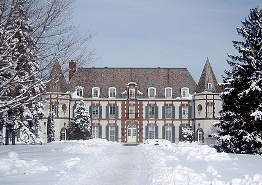 For example, there are activities like sledding, snowball fights, ice skating, hockey, and skiing throughout much of the school year. Hang-out time means hot chocolate, comforting food, and great conversation with friends. Learn all you can about campus life in the cold. Ask current college students what they like to do in the winter and explore the school’s website for special events and traditions. Big winters can be a student’s favorite thing about a college. When high school students come from places that do not vary much between seasons, they are sometimes surprised at how much they like the dramatic changes in the weather. Cold weather colleges also provide one of the most exciting moments for a campus full of snow-bound students: the arrival of spring. It becomes almost an unofficial event: campus life changes suddenly as everyone makes the most of the warmer weather. The transformation is one of our alumni’s favorite moments. As you can tell with the examples above, cold weather schools can provide a lot of great experiences. However, our interviewees cautioned that high schoolers should know what to expect from the weather. Winter can begin early and last a long time. The cold weather might make leaving the warmth of a residence hall tougher, but students should still make the effort to get out and socialize. It is important to explore new places, participate in campus life, and spend time with friends. Otherwise, a person can start to feel cooped up during an especially long winter. High school students may want to discuss this concern with friends and family members who have attended cold weather colleges. They should also explore the resources a school offers that will help them become part of the community. After all, wherever students attend college, they should feel at home. In Part 2 of our article, get more advice on what to do on a campus visit and what to expect as a student at a cold weather college.